The filters in Thomas Duplex Super Safelights will deteriorate with age and should be examined periodically to ensure that the light is still properly filtered. The manufacturer recommends replacing the filters every 5 or 6 years. 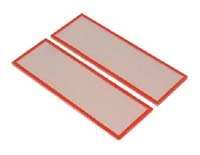 If you require replacement filters for the model DUB safelight (for B&W papers and ortho materials) or DUX safelight (for X-ray film), this is the set of red edge filters that fit in the vanes of the safelight. FBD B&W (yellow edge), and FXD (green edge) filter sets that fit in the body of the safelight are also available - please see the separate listings.